The focus of my scientific work is on problems concerning dynamics (differential equations, dynamical systems, stochastic systems) in modelling, analysis, numerics, simulation and optimization of complex scientific, medical and engineering systems (among others: surface chemistry and catalysis, growth analysis in orthodontics, distributed robotics, self-organization, neuroscience and olfactory system, rotating machinery, traffic networks). Besides mathematical theory, real-world applications of nonlinear mathematics are an important part of my work. My research contains in particular the interplay between discrete and continuous as well as deterministic and stochastic models and corresponding methods. New Journal of Physics 11, 073012, 2009; Europhysics Letters 73 (6), 820 - 825, 2006. (2) Pattern formation principles to control cooperative robots: Pattern formation principles were used to construct a self-organized control for distributed robots and flexible manufacturing sytems. It can be proven that only feasible solutions of the underlying combinatorial optimziation problem emerge from the pattern formation principle. This is in parts joint work with C. Ellsaesser, University of Heidelberg, T. Fukuda (Nagoya University), H. Haken (University of Stuttgart), P. Molnar (Clark Atlanta University) and M. Schanz (University of Stuttgart). For details see e.g. Physics Letters A 375, 2094 - 2098, 2011; The International Journal of Robotics Research 24, 465 - 486, 2005; IEEE Transactions on Systems, Men and Cybernetics: Part B, 31, No. 3, 433 - 436, 2001. (3) Pattern formation in many-particle systems: It is proven that a interacting many-particle system of different particle types with attracting interactions between particles of the same type and repulsive interactions between particles of different type converges under certain assumption to a sorted state. This is joint work with S. Kokkendorff (DTU), J. Strotmann (University of Hohenheim), N. Hummel (University of Heidelberg). For details see SIAM Journal on Applied Mathematics (SIAP) 70(7), 2534 - 2555, 2010. A number of analytical as well as numerical investigations to detect and continue bifurcation points were performed. This includes the analysis of the smoothing of a piecewise defined dynamical system, continuation of tori and an existence proof af a Hopf bifurcation in a network of bio-chemical reactions. This is in parts joint work with B. Krauskopf, H. Osinga (Auckland, New Zealand), M. Elmegaard, F. Schilder, J.J. Thomsen (DTU), O. Corradi and P. Hjorth (DTU), M. Eiswirth (Fritz Haber Institute Berlin, Germany), M. Inagaki (Toyota CRDL, Japan). For details see e.g. SIAM Journal on Applied Dynamical Systems (SIADS), 13(3), 1202-1238, 2014; Journal of Sound and Vibration 332(22), 5883 - 5897, 2013; SIAM Journal on Applied Dynamical Systems (SIADS), 11(3), 1007-1032, 2012; Nonlinear Dynamics 51(4), 529-539, 2008; Journal of Chemical Physics 115, No 10, 4829 - 4838, 2001. (1) Implicit equation-free methods: In the framework of equation-free approaches implicit methods were developed which avoid so-called lifting errors. The equation-free approaches allow to analyse quantities of interest which live on a macroscopic level even though no equations are known on that level but only microscopic model equations. By short simulation bursts of the microscopic model it is possible to obtain sufficient information for a detailed numerical analysis of the macroscopic dynamics including continuation techniques and bifurcation analysis. Error estimates can be given for the implicit methods. This is joint work with C. Marschler (DTU), J. Sieber (Exeter, UK), R. Berkemer (AKAD Stuttgart, Germany), A. Kawamoto (Toyota CRDL, Japan). For details see SIAM Journal on Applied Dynamical Systems (SIADS), 13(3), 1202-1238, 2014. (2) Robust equation-free detection and continuation of a Hopf bifurcation point: A robust numerical approach was suggested to detect a Hopf-bifurcation point in an equation-free framework and perform a two-parameter continuation of the Hopf bifurcation point. This is joint work with O. Corradi and P. Hjorth (DTU). For details see SIAM Journal on Applied Dynamical Systems (SIADS), 11(3), 1007-1032, 2012. Stochastic many-particle systems have been formulated and investigated. 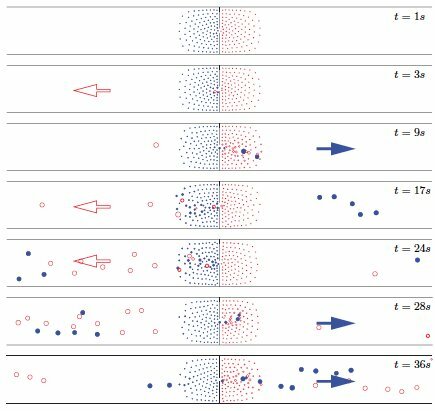 Construction of a mesoscopic stochastic lattice model for fast simulations of large particle numbers for systems with local mixing by diffusion. Fluctuation induced pattern formation was investigated. 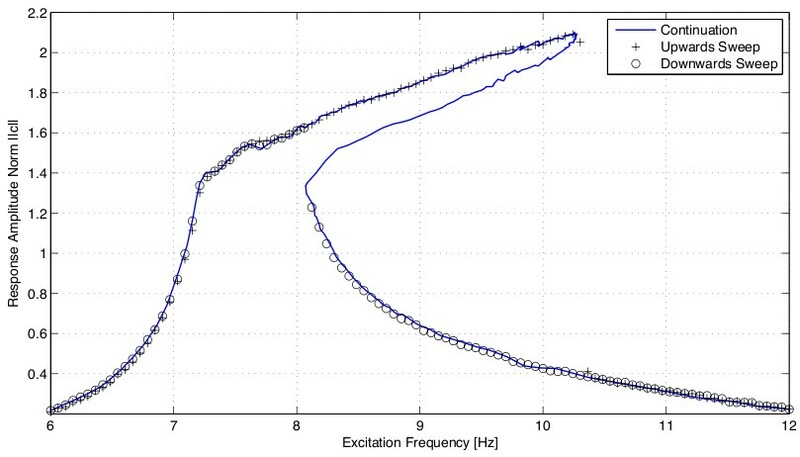 Limit equations of stochastic many particle systems were rigorously derived. This is joint work with M. Eiswirth, H. Rotermund, G. Ertl (Frith Haber Institut, Berlin), K. Oelschlaeger (University of Heidelberg) and C. Reichert (University of Heidelberg). For details see e.g. Europhysics Letters 73 (6), 820-825, 2006 or Journal of Chemical Physics 115, No 10, 4829-4838, 2001. (1) Dynamical system approaches to combinatorial optimzation: A dynamical system was constructed to find feasible solutions of combinatorial optimization problems (in particular assignment problems). It was proven that the ω-limit set of the constructed dynamical system is identical to the set of feasible points of assignment problems. Details can be found in the chapter J. Starke: "Dynamical System Approaches to Combinatorial Optimization", Pages 1065-1124 in "Handbook of Combinatorial Optimization" (Eds. Pardalos, P., Du, D.-Z. and Graham, R.), 2nd Edition. Springer Verlag, Heidelberg, New York. 2013. (2) Iterative procedure to estimate parameter in differential equations: Joint work with J. Rübel and C. Lux (University of Heidelberg). For details see Annals of Operations Research 119, Special Issue on Optimization in Medicine, 75-100, 2003 and Journal of Mathematical Biology 51 (2), 157-170, 2005. (3) Shape optimization with eigenvalue contraints: This is joint work with F. Strauß (University of Heidelberg) and M. Inagaki (Toyota CRDL, Japan). For details see Structural and Multidisciplinary Optimization 34, 139-149, 2007. (1) Continuation and bifurcation analysis of experiments: Methods for tracing solutions including unstable ones in controlled lab experiment were further developed and extended such that stability information can be extracted from the experiments. This allows to obtain valuable experimental information which is important for model development and verification. By this, it is possible to systematically explore how stable and unstable steady state periodic vibrations depend on parameters. This is joint work with F. Schilder, E. Bureau, I. Santos and J.J. Thomsen (DTU). For details see Journal of Sound and Vibration 332 (22), 5883-5897, 2013 & Journal of Sound and Vibration 333(21), 5464-5474, 2014. (2) Decomposition and low-dimensional description of spatio-temporal data: Methods to decompose high-dimensional data and a few leading modes were developed on basis of statistical methods like PCA and ICA such that temporal changes of mode coefficients could subsequently be modeled and analysed. This is joint work with J. Reidl, J. Rübel, C. Lux (University of Heidelberg), D. Omer, A. Grinvald (Weizmann Institute of Science) and H. Spors (Max Planck Institute for medical research, Heidelberg). For details see e.g. Annals of Operations Research 119, Special Issue on Optimization in Medicine, 75-100, 2003; Journal of Mathematical Biology 51 (2), 157-170, 2005; NeuroImage 34, 94 - 108, 2007. 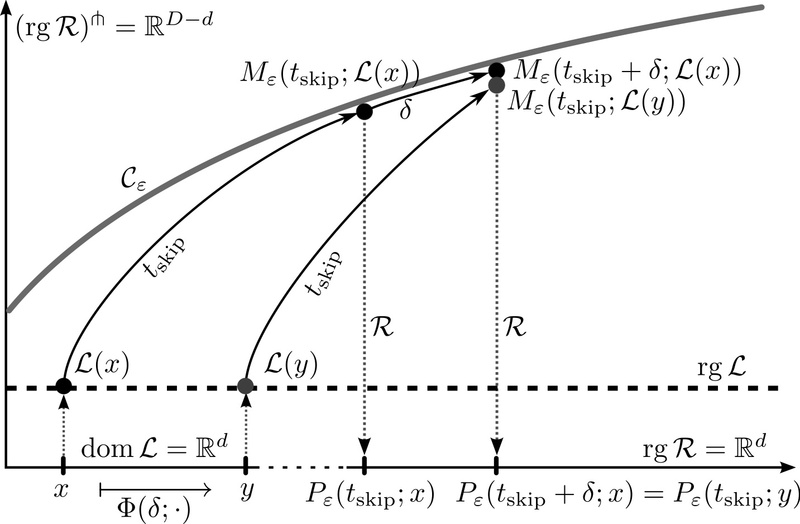 (3) Visualization of Neimark-Sacker bifurcation in experimental data: Poincare sections visualize a Neimark-Sacker bifurcation in data from rotating machinery. This is joint work with F. Schilder (DTU), J. Rübel (University of Heidelberg), H. Osinga (University of Bristol), B. Krauskopf (University of Bristol) and M. Inagaki (Toyota CRDL, Japan). For details see Nonlinear Dynamics 51(4), 529-539, 2008. (1) Equation-free analysis of particle models: The macroscopic behaviour of a microscopically defined particle model for pedestrian crowds is investigated by equation-free techniques where no explicitly given equations are available for the macroscopic quantities of interest. We investigate situations with an intermediate number of particles where the number of particles is too large for microscopic investigations of all particles and too small for analytical investigations using many-particle limits and density approximations. By developing and combining very robust numerical algorithms it was possible to perform an equation-free numerical bifurcation analysis of macroscopic quantities describing the structure and pattern formation in the particle model. The pedestrian flow shows the emergence of an oscillatory pattern of two crowds passing a narrow door in opposite directions. The oscillatory solutions appear due to a Hopf bifurcation. This is detected numerically by continuation of a stationary state of the system. Furthermore, a two-parameter continuation of the Hopf point is done to investigate the oscillatory behaviour in detail using the door width and relative velocity of the pedestrians in the two crowds as parameters. This is joint work with O. Corradi and P. Hjorth (DTU). For details see SIAM Journal on Applied Dynamical Systems (SIADS), 11 (3), 1007-1032, 2012. (2) Coarse analysis of a pedestrian model using diffusion maps: This is joint work with P. Liu, I. Kevrekidis (Princeton, USA) and C. Marschler (DTU). For details see Physical Review E 89(1), 013304-013314, 2014. (3) Control-based continuation in pedestrian flow simulations: This is joint work with I. Panagiotopoulos (University of Rostock, Germany). New Journal of Physics 11, 073012, 2009. (2) Traffic jam control: It is shown that a deterministic as well as a stochastic modulation of the safety distance can extend the stability region of the uniform flow and therefore reduce traffic jams. This is a collaboration with Y. Gaididei (Kiev, Ukraine), R. Berkemer (DTU), P. L. Christiansen (DTU), A. Kawamoto & T. Shiga (Toyota CRDL, Japan) and M.P. Sørensen (DTU). For details see NHM (Networks and Heterogeneous Media) 8(1), 261-273, 2013, and Physical Review E 88(4), 042803 - 042815, 2013. (4) Equation-free approaches are used to investigate the macroscopic behaviour of single lane traffic models: Even though the considered models are defined on a microscopic level, the quantities of interest live on a macroscopic level but quite often for this no explicit model equations are available. By short simulation bursts of the microscopic model it is possible to obtain sufficient information for a detailed numerical analysis of the macroscopic dynamics including continuation techniques and bifurcation analysis. The investigations focus on travelling waves of traffic jams such as the ratio of cars being involved in the traffic jam depending on model parameters like driver sensitivity or maximal velocity. This is joint work with C. Marschler (DTU), J. Sieber (Exeter, UK), R. Berkemer (AKAD Stuttgart, Germany), A. Kawamoto (Toyota CRDL, Japan). For details see SIAM Journal on Applied Dynamical Systems (SIADS), 13(3), 1202-1238, 2014. (1) Continuation and bifurcation analysis of experiments: Applying continuation methods directly to a controlled lab experiment allows to obtain valuable experimental information which is important for model development and verification. By this, it is possible to systematically explore how stable and unstable steady state periodic vibrations depend on parameters. The approach is tested on a driven mechanical oscillator with a strong impact nonlinearity, controlled with electromagnetic actuators. The controller is tuned such that the steady state dynamics of the controlled experiment matches that of the corresponding un-controlled experiment. 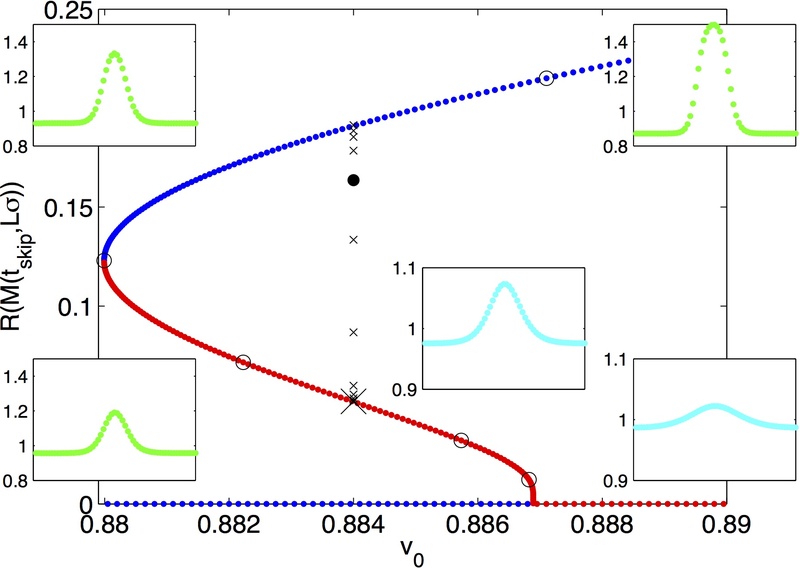 The figure shows an experimentally obtained bifurcation diagram (amplitude over driving frequency) including the unstable branch. This is joint work with F. Schilder, E. Bureau, I. Santos and J.J. Thomsen (DTU). For details see Proceedings of ENOC Conference, 24-29 July 2011, Rome, Italy; Journal of Sound and Vibration 332(22), 5883-5897, 2013 & Journal of Sound and Vibration 333(21), 5464-5474, 2014. 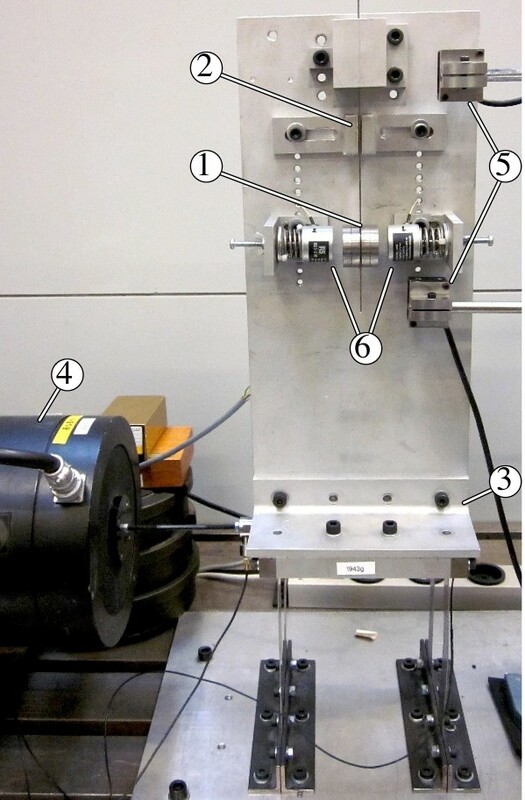 (2) Mathematical modelling of rotor bearing systems with application to a turbocharger: A minimalist model for a rotor bearing system with oil film lubrication in a floating bush bearing system was developed and analyzed. This is joint work with M. Inagaki, A. Kawamoto, T. Abekura, A. Suzuki (Toyota CRDL, Japan) and J. Rübel (Heidelberg, Germany). See Journal of System Design and Dynamics 5(3), 461-473, 2011. 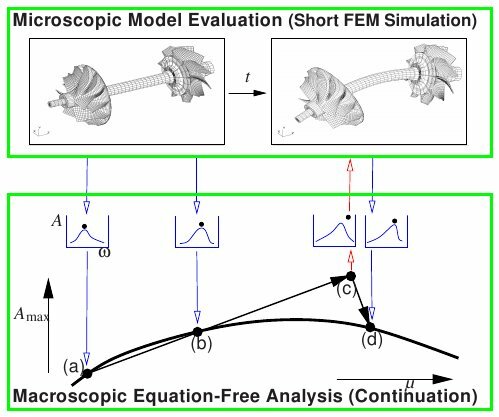 (3) Shape optimization of rotating machinery: Reduction of vibration level in rotordynamics by design optimization We focus on the reduction of the vibration level of rotors by optimizing the shape of the body. The target is to reduce rotor weight and rotor vibrations leading to higher efficiency and less noise.We consider a finite element discretization of the rotor using a Rayleigh beam model which includes rotary inertia and gyroscopic moments leading to nonselfadjoint systems. We present a general algebraic framework for this case. The mass function is the objective function of the optimization problem and constraints are set on the nonlinear and nonconvex functions of critical speed and unbalance response. For the numerical solution, algorithms belonging to the class of sequential convex programming are applied for the example of a turbocharger. A remarkable reduction of mass of an initially given prototype could be achieved while significantly reducing the unbalance response and raising the critical speeds. This is joint work with F. Strauß (University of Heidelberg) and M. Inagaki (Toyota CRDL, Japan). For details see Structural and Multidisciplinary Optimization 34, 139-149, 2007. (4) Analysis of rotating machinery: Efficient computation of quasiperiodic oscillations in nonlinear systems with fast rotating parts We present a numerical method for the investigation of quasiperiodic oscillations in applications modeled by systems of ordinary differential equations. An important element of our approach is that it allows us to verify whether one can neglect gravitational forces after a change of coordinates into a corotating frame. Specifically, we show that this leads to a dramatic reduction of computational effort. A turbocharger model is studied as a practical example. This is joint work with F. Schilder (DTU), J. Rübel (University of Heidelberg), H. Osinga (University of Bristol), B. Krauskopf (University of Bristol) and M. Inagaki (Toyota CRDL, Japan). For details see Nonlinear Dynamics 51(4), 529-539, 2008 and DETC2009-87339, Proc. of the ASME 2009 International Design Engineering Technical Conferences & Computers and Information in Engineering Conference, IDETC/CIE 2009. Physics Letters A 375, 2094-2098, 2011; The International Journal of Robotics Research 24, 465 - 486, 2005; IEEE Transactions on Systems, Men and Cybernetics: Part B, 31, No. 3, 433-436, 2001. The Cleft Palate-Craniofacial Journal 39(3), 341-352, 2002, Annals of Operations Research 119, Special Issue on Optimization in Medicine, 75-100, 2003 and Journal of Mathematical Biology 51 (2), 157-170, 2005.